Continuing our look at big brand-name Freediving and Spearfishing companies in Europe, I managed to get to Omersub for a look at their history and product line today. In the end of the 70’s O.Me.R. company was born with the aim to satisfy the needs of very demanding and professional spearfishermen, who wanted top quality equipment. The founder is Valerio Grassi, one of the most known and famous persons in the spearfishing world, today 90 years old, but still in good shape. He brought all his experience from the Beretta Company, specialized in ballistics and production of guns. This know how led to the first very interesting spearguns. The name O.Me.R. stands for “Officine Meccaniche Rezzato”, where “officine meccaniche” means mechanical workshops and Rezzato is the name of the town, near Milan, in the North of Italy, where the company was initially based. In 1993 Omersub was bought by the Italian giant Beta Tools Company, owned by the Ciceri family, at the time and still today strongly known for production of very high quality manual and pneumatic professional tools. By then Omersub had become point of reference for all the passionate and professional spearfishermen and freedivers. In 2009 Omersub also bought Sporasub brand, after it had been owned by Mares with no success, and started positioning it as the top line brand of the company. In 2013 Omersub has become part of Aqua Lung Group, one of the largest diving groups in the world. Intelligently enough, Aqua Lung, present in the areas of swimming, fitness and scubadiving, but not spearfishing and freediving, decided to buy the number one company in such sectors. Aqua Lung is a French company born in 1946 as “La Spirotechnique”. Its first diving regulator commercialized was the CG45, named Aqua Lung in English Speaking countries. The French company was born from the experience and passion of Jacques-Yves Cousteau and Émile Gagnan, who actually developed the first “Aqua-Lung.” We could say the Company has introduced the world to Scuba diving. Today, both Aqua Lung International and Aqua Lung America are highly successful divisions of Air Liquide. This Group is a French multinational company founded in 1902, which supplies industrial gases and services to various industries including medical, chemical and electronic manufacturers. With more than 200 employees in the U.S. and over 500 employees worldwide, Aqua Lung International now has 12 divisions throughout the world. With the acquisition by Aqua Lung, Omersub has today more strength than ever in approaching the market, investing in R&D and offering best worldwide spearfishing and freediving products. It is also going through a strong renovation of its worldwide distribution network, basing most of it on the already existing capillary Aqua Lung network. Based in Sovico, Monza, near Milan, Italy, the headquarters of Omersub are the heart and mind of the company, where all products are thought, designed and tested…but not manufactured. Almost the whole of the production of the Omer product line is done externally, in Italy and also a good part in Cina, but with extreme attention to quality. The use of many different suppliers and manufacturers is aimed to having the best partner for every single product. 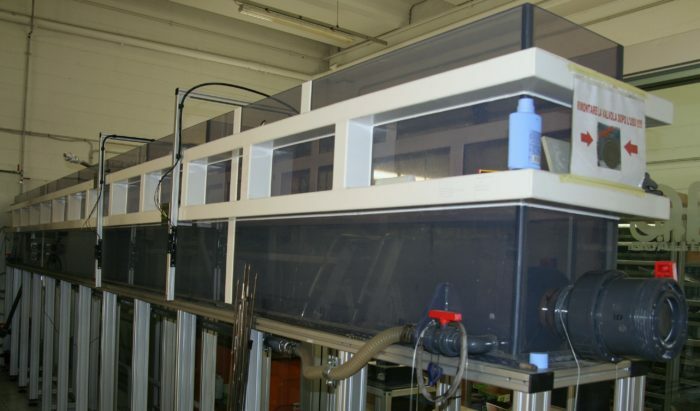 Moreover, final quality control is executed in Italy. Omersub product line is practically the most complete range of products in the spearfishing and freediving worlds. It is divided in four different brands, Omer, Omer Acessories, Sporasub and the new brand by Umberto Pelizzari, the great Italian free-diving world champion, multi record-man in both variable and constant weight, and founder of Apnea Academy. While Omer is the base brand and most known around the world, Sporasub is positioned as the top of the line brand and Umberto Pelizzari has high level products focused mainly on freediving, but not only. The astonishing product line of Omersub goes from anything needed for spearfishing, such as guns, fins, masks, knives, suits, to any spearfishing accessory by Marco Bardi, an incredibly strong Italian champion. Curious and useful examples of his ideas are the neoprene seat covers for driving with suits on without ruining your car seats and the comfort belt, which is an additional neoprene belt to wear under the weight belt for better comfort and stability. 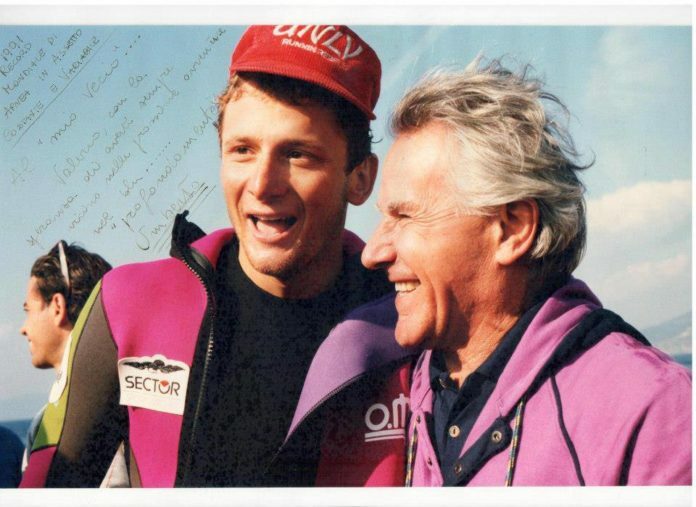 Both Pelizzari and Bardi have been part of Omer team since the early days with Valerio Grassi. Omersub product line is extremely wide and offers almost anything, so we decided to have a chat with Paolo Gismondi, sales manager, regarding the most interesting products and the way they are designed. He ran us through the main equipment of the three brands. We started with the new Umberto Pellizzari brand, born in July 2013. All products under such name are thought directly from Pellizzari and then designed by Omersub and Momo Design company. The latter is an Italian company focused on design, looking for functionality, beauty, style, harmony and innovation. What is extremely interesting today in the Umberto Pellizzari product line is that, as Gismondi pointed out, Pellizzari is completely involved in every part of the thinking, designing and production phases. Nothing to do with just using his name as a marketing tool. 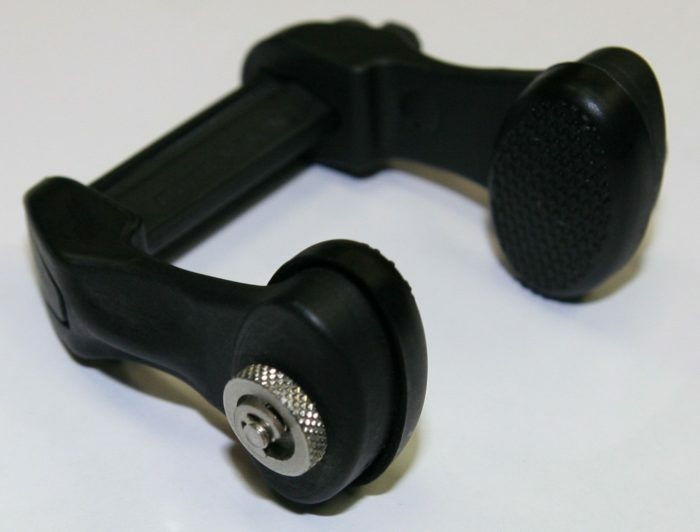 Interesting products are the nose clip, made to be able to compensate without using one’s hands. The system can be regulated thanks to a micrometrical screw, which determines the pressure at which the plug opens by blowing in the mask with the nose. The mask, named UP-M1 and UP-M1C in the 100% carbon fibre frame version, is produced in Japan and designed by Momo Design to obtain minimum possible internal volume. 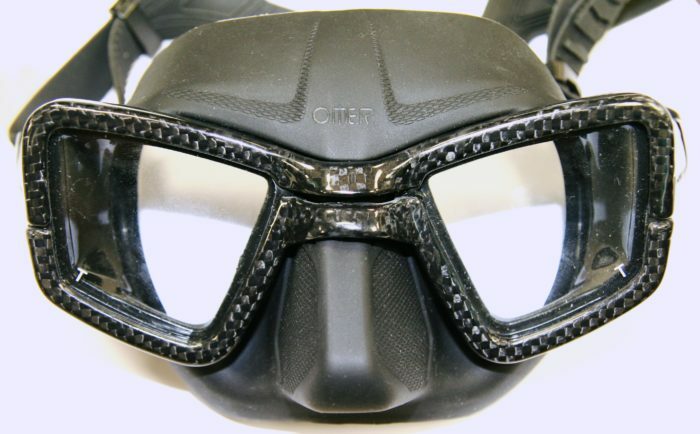 This solution permits, as indicated by Omersub, to compensate the mask much deeper than the 8/9 m reached with standard masks, incredibly increasing comfort and easiness of use. This innovative product is specifically designed to have sufficient space for the nose clip. An additional important feature of this mask is the field of vision, which is almost the same you have without wearing a mask and around 30% more than traditional masks, such as the Alien. The mask external silicone surface features a milled surface that prevents refraction of sunlight. Another really innovative product is the freediving computer, the UP-X1. Made for freediving, it is also of great help for spearfishing. Main innovations are surface time, meaning you have an indication of your recovery time after your last dive, dive time, which is actually quite a standard function, the disconnectable Dive function, to be able to swim without it turning on, and, most interesting of all, the heart rate monitor, which gives instant pulse frequency at any moment, both under water and on the surface.  This aspect is of extreme importance, and can consistently help both in freediving and spearfishing. In fact, it is true that recovery time after a dive is a very discussed and talked about topic. Some theories, like Apnea Academy, indicates a good recovery period after a dive as equal at least to double the time of the dive. 1 minute 30 seconds dive would require at least 3 minutes recovery. This is a very general and indicative value, since it is true that each one of us has different physical characteristics and training. 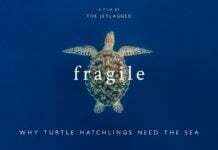 Also each day and situation brings us to have different physical statuses, meaning our performance can change from period to period, day to day and dive to dive. When spearfishing, seeing a prey can generate acceleration of heart beat, in freediving an attempt which is close or beyond your limit can generate stress, nervousness, emotions and thus increase in heart rate. For these reasons, a continuous control of our pulses is of incredible help. After each dive a check of whether your heart rate is back to normal gives you an additional indication if you have or not recovered from your previous dive. From a design point, the heart rate monitor on the computer is connected wifi to a sensor band that has to be dressed around ones chest and under the suit. This is comfortable for freediving while it has the need of some attention in spearfishing, as the sensor must not be in the way of the area on the chest where the speargun has to be positioned for charging. A nice carbon fiber frame decors the watch computer indicating a high level product, designed by Momo. The UP-X1 computer and the nose plugger are just two of the new, first time, Omersub complete freediving product line, ultimated by mask, fins and suit. The latter is of great interest and is produced in two thicknesses 2 and 4 mm, named UP-W12 and UP-W14. The suit is aimed for freediving and triathlon, and is composed of softer neoprene under the arms and behind the knees for better comfort during swimming and freediving. The neoprene is internally lined and smooth outside. Distinctive characteristics are the ultra stretch collar to avoid loss of warm water and the rear competition closing zipper, from top to bottom, which guarantees better isolation and protects from accidental opening during races. As it often happens it is a speargun the most sold product of the Omer line, the Caiman HF Camu 3D. Thanks to the innovative and exclusive technology HF (Hydro Forming) utilized by Omer for the first time in the spearfishing world, such speargun has incredible characteristics. The aluminum anticorrosive alloy barrel is manufactured to obtain a cuttlefish bone shape that optimizes the buoyancy of the gun, thanks to the greater internal volume, and the stability of the weapon, giving the shot an incredible precision. Brandishing is at top level. Omer indicates rigidity of the barrel 33% greater than the best cylindrical carbon fiber solutions, thanks to material and geometry. The special camouflage Camu3D is obtained thanks to the “Heat Transfer” process, which consists in positioning a camouflaged colored film on the gun and then heat it in an hoven. The action of heat and a chemical process transfer colors from the film to the gun in a definitive solution, which makes the coloring resistant to abrasion. Sporasub is positioned to be the top of the line brand in the Omersub family. There is still work to be done, but some examples can well indicate the work and the attention, and probably some additional justified costs, of Sporasub products. 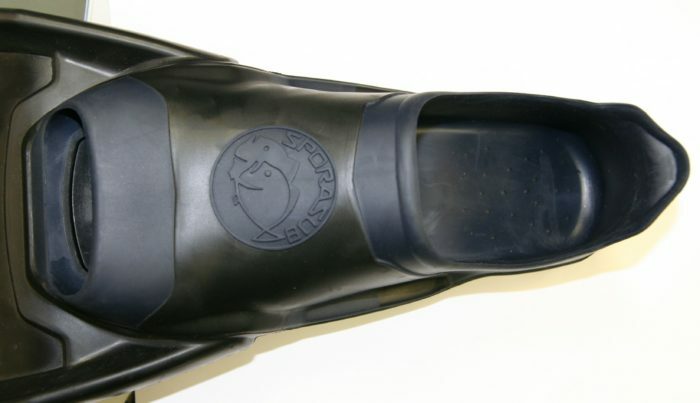 An example are the Sporasub fin foot pockets. As only in a few cases present on competition brands, these pockets are made through a special rubber compression process that permits to have different kinds, and stiffness, of rubbers in the various areas of the foot. In the sole of the foot and on the instep, rubber must of course be stiffer so it does not bend and manages to transmit the movement of the leg and foot to the fin. Other areas such as the heel and the fingertips must be softer for greater comfort. This is easily visible as on the fin foot pocket the softer areas are made of a grey color, while the stiffer ones are black. This details help comfort and transmission of strength, but need, as said, a specific compression process of different rubbers, which is obtained through specific technology and more expensive production. Exciting part of the visit to Omersub has surely been the walk in the testing rooms. 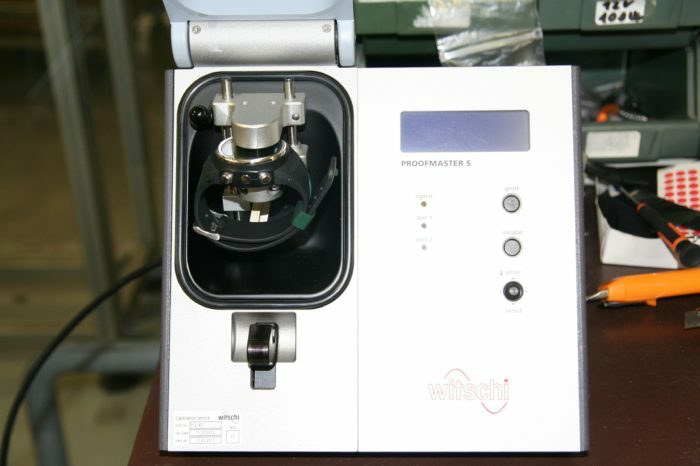 Specifically built machinery was present to analyze behavior, performance and reliability of most Omersub products. From spearguns, to fins, to computer watches, testing and researching is at the base of all equipment designed by the Italian company. To obtain best results and performance a 7 meters long pool has been designed to test power and reach, but also precision, of Omersub spearguns. The gun is positioned steadily on one side of the pool and a shaft is shot reaching a board a few meters away. The measure of the quantity of the shaft that has passed through the board gives the value of the strength and reach of the shot, while the precision is given by the read on a circular target drawn on the board. Testing on spearguns is also brought forward by optimizing the recoil reduction and the grip comfort and precision using a second machine. The latter permits to insert a tang in a cylinder under a specified pressure. The grip to be tested is then inserted and attached to the cylinder. The shaft is blocked into the release system of the trigger and is then release at a defined variable pressure equivalent to different powers generated by rubber bands of different thicknesses and numbers. 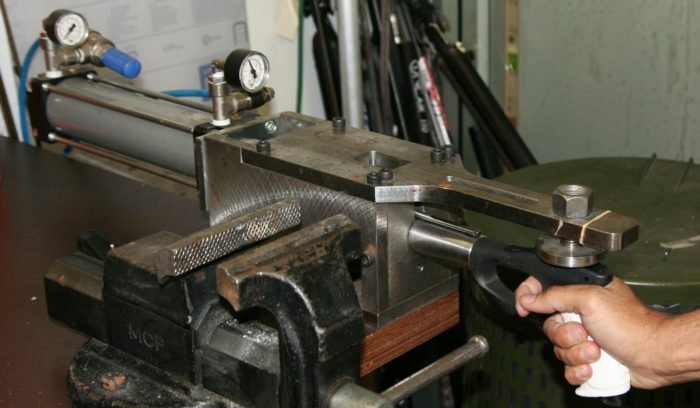 The transmission of the power to the hand gives feedback on recoil and quality of the grip. Passing on to fins, another pool is set to contain a machine that, with a metal arm, rotates a fin mounted on it. Movement is rotational up and down, only similar to a fin stroke, but good enough to give feedback on fin resistance and possible points of breakage after hours and hours of movement. 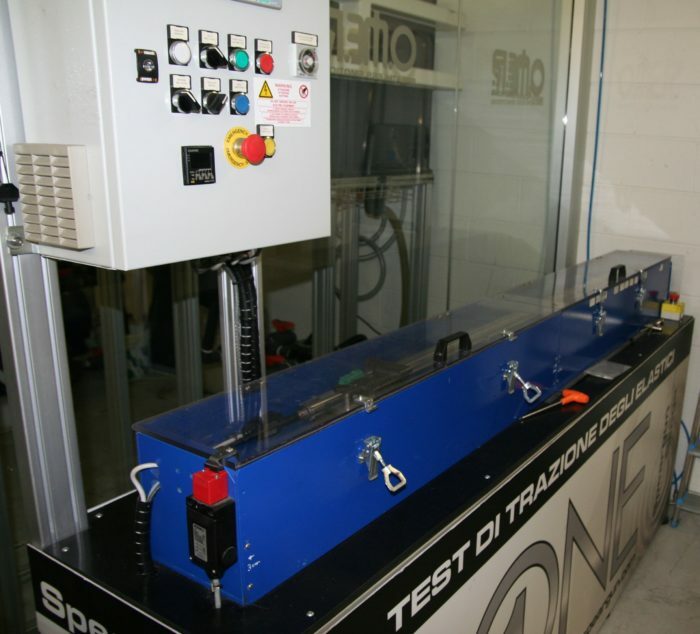 Many other machines are in the R&D area of Omersub, such as traction test machine for elastic bands, pressure resistance tanks for computer watches and spearguns, computer watches temperature high variation testing and computer case fluctuation testing for pressure variation. Join us tomorrow as we continue our in-depth look at Omersub with an interview with General Manager Lorenzo Borri. 43 years old, living between Rome and Sardinia island, Italy, Carlo is a journalist and mechanical engineer. 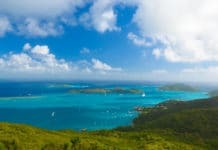 His greatest passion is the sea, without which he says he could not live. He practices spearfishing since the age of 14. Frequent fishing areas are the Mediterranean, in particular the island of Sardinia, Lazio and Tuscany coasts (including Giglio and Ponza islands).